A global federation of teachers' trade unions has joined calls for a stop to attacks on tribal schools in the Philippines, especially in the southern region of Mindanao. Education International, which has over 400 member organizations in 172 countries, said the reported occupation of school premises by the Philippine military "violates the right to education of children." The call was aired in a letter of concern the group sent to President Rodrigo Duterte on July 27. On July 24, the president called for airstrikes on tribal schools suspected of harboring communist guerrillas. Duterte claimed that the schools "teach children to rebel against the government." The president, however, clarified that he had no plans to kill tribal children but only wanted to "destroy" schools without government permits. "It is the illegal [tribal] schools which drew the president's adverse reaction," said presidential spokeswoman Ana Marie Banaag. 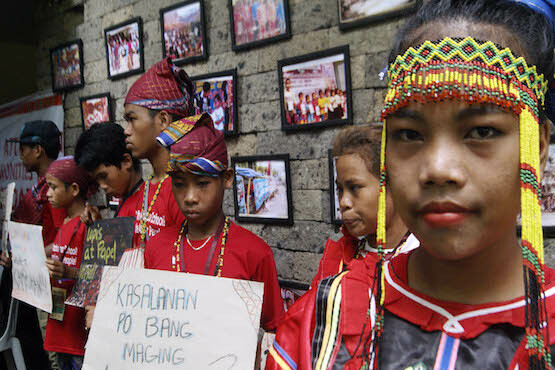 On July 28, the presidential palace accused three tribal schools in Mindanao of allegedly spreading subversive ideas. The three schools were established and supported by religious groups and civic organizations in Mindanao. The president's statement drew flak from activist and human rights groups in the country. The group Save Our Schools, a network advocating for the tribal children's right to education, said that even the past administration "viciously attacked and forcibly closed" tribal schools. In 2015 two tribal leaders and a tribal school director were killed by militiamen reportedly under the control of the military. Aside from calling to a stop to the attacks, the group also called for the continuation of peace talks between the government and communist rebels and include issues confronting tribal communities. For its part, Education International called on its members around the world to send letters to the Philippine government to protest Duterte's statement. As advocates of "safe schools, children's education, and indigenous people's rights," Education International called on the Philippine government to sign the "Guidelines for Protecting Schools and Universities from Military Use during Armed Conflict." The guidelines is an intergovernmental instrument that aims to protect students, teachers, schools, and universities, and prohibits the "use of schools and universities for any purpose in support of the military effort." The group said the global "teaching community" will monitor the situation in the southern Philippine and "mobilize further" should the Philippine government attacks tribal communities. The Alliance of Concerned Teachers in the Philippines earlier raised concern over reported attacks by paramilitary groups on at least 68 tribal schools in Mindanao in the past year. The attacks resulted in the death of three tribal educators during the first quarter of 2017.